I don’t know about you, but exercising just to watch my waistline makes me sad and unmotivated, which is why I’ve had a hard time in the past consistently staying active. I felt like I didn’t have the time or motivation to get myself to the gym. You may have heard of Jeremiah, our beloved Super User who lost 100 lbs with a Healthy Ride and clean eating. He found time to bike during his lunch breaks (A.K.A. blunch rides), and he did it because it was fun. If you’re looking for a way to exercise and enjoy yourself simultaneously, this 40-minute ride is for you. Natalie (SCA Fellow and Outreach Guru) and I rented bikes from the Whitfield St & Baum Blvd station, right behind the gorgeous East Liberty Presbyterian Church. We crossed Penn Ave with no problem and climbed the hill that is Highland Ave. Natalie and I made it to the main entrance of the park with our legs feeling a bit noodly. Despite the sweaty helmet hair and odd wheezing noises we were pretty proud of ourselves. 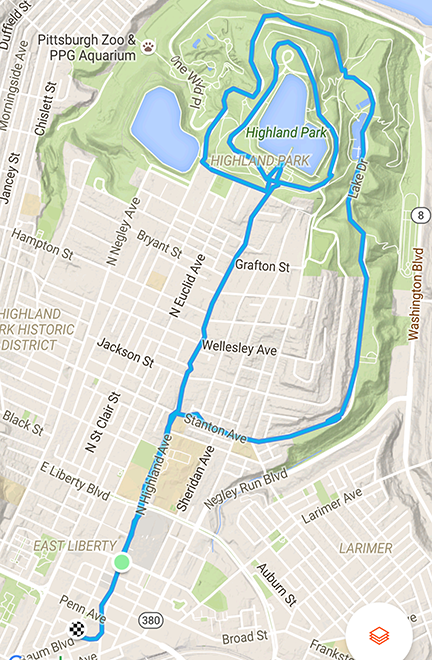 We rode the bike lane inside Highland Park then turned right out of the entrance to make the bigger loop. On the outer loop we hit an intimidating, windy hill, but after a quick water break we managed the rest of the ride with gusto! The cruise down Stanton Ave ended the ride with a cool, relaxing stretch. I have to admit, I didn’t know how tough a slight hill could get – even in first gear. Samone-tip: Pull your bike route up on Google Maps. It has a feature that shows you the change in elevation. This way, you can choose a smoother path or prepare for your climb. On any given day, biking gives me a reason to exercise, whether it’s to get to work, to see a friend, to go on a date, or see the city. I’m able to be consistent with this form of exercise because it’s intertwined with my life and other priorities. I hope you also find what makes you excited about moving, whatever that may be. 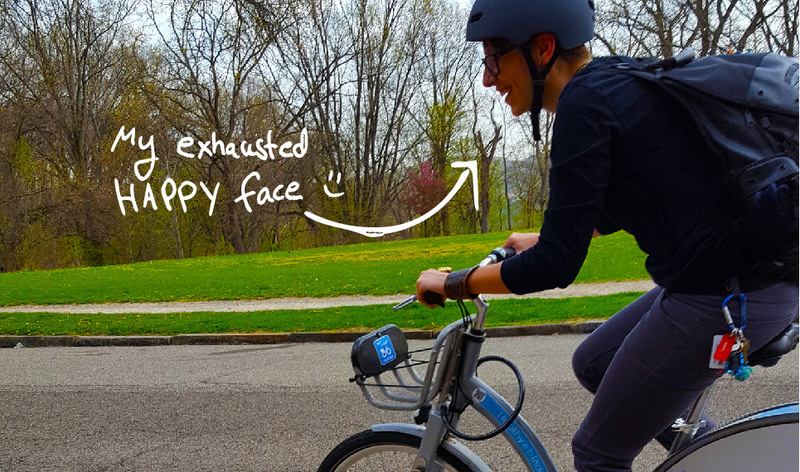 Follow Samone’s trips on the Healthy Ride blog, Facebook, Twitter & Insta for route tips, life-hacks and bike-hacks.